For five years, I have worked as the staff herpetologist at Las Casas de la Selva, a sustainable forestry project in Puerto Rico. I’ve also had the privilege of spending five months in Panama; some of that time was spent working with PARC and I have noticed many similarities between Puerto Rico and Panama. Specifically, I have noticed how each country has a frog as a national and cultural symbol. In Panama, everyone knows of the Golden Frog (Atelopus zeteki), and when I was studying the folklore of Panama, I heard old stories about how the frog was good luck, and that people used to believe that it turned to gold when it died. Nowadays, the Golden Frog is a symbol of Panama itself, and what it means to be Panamanian. Images of the Golden Frog adorn everything from lottery tickets to t-shirts to coffee mugs. Some of my friends in Panama have even gone so far as to get Golden Frog tattoos. And each year, thousands of people celebrate Golden Frog Day. As an island, Puerto Rico has very few species of frogs, and 16 of the 18 native species belong to the genus Eleutherodactylus. This genus is referred to collectively as “Coquis”, although only two species make the distinctive “Ko-Kee” mating call that makes nighttime in Puerto Rico such a noisy affair. Of the 16 species of Coquis, 13 are listed by the IUCN as either Vulnerable, Endangered, or Critically Endangered. As with the Golden Frog in Panama, Coquis are a symbol of everything Puerto Rican. Mainland-born Puerto Ricans who return to the island respond to challenges about their Puerto Rican “authenticity” used to respond, “I’m as Puerto Rican as the Coqui”. Images of the Coqui show up on artistic murals, tourist kitch, and tattoos; there is even a “Coqui” brand of coffee and a “Coqui” car dealership! 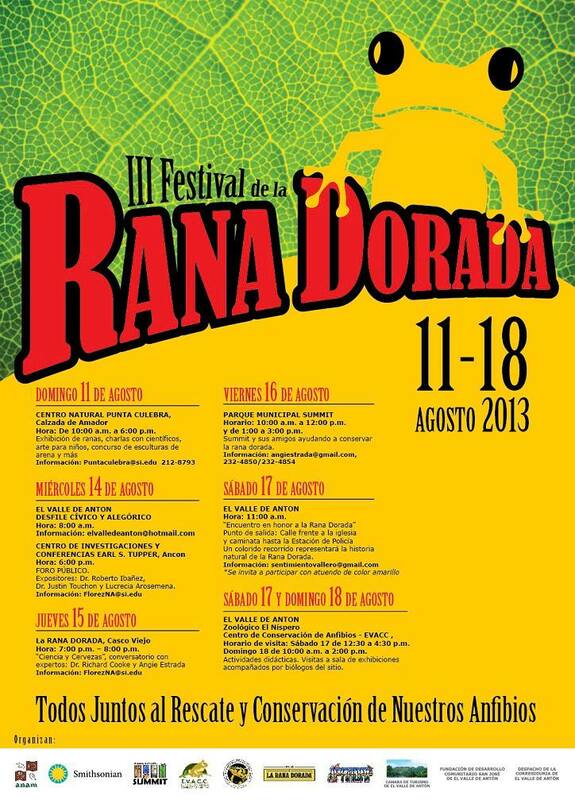 But we are missing something in Puerto Rico- we have no equivalent to the “Dia de Rana Dorada”. After my time at PARC, including my opportunity in 2012 to help Angie Estrada, Jorge Guerrel, Ligo Diaz, and the rest of the staff plan and execute educational activities at the Summit Zoo, I decided to take the spirit of “Dia de Rana Dorada” back to Puerto Rico with me. The idea has been well-received, and the first “Dia del Coqui” will be a weekend-long festival from September 26th-28th, 2014. It will be held at the Jardin Botanical y Cultural William Miranda Marin in the centrally-located city of Caguas. Already, artisans, scientists, musicians, university students, historians, and public-works officials are coming together to make this event a success. The intention of Dia del Coqui is to be a cultural celebration, but also an important learning tool to help the people of Puerto Rico know that the frogs that they have always shared the island with are in need of conservation. We hope that Dia del Coqui becomes a cultural mainstay in Puerto Rico, akin to Dia de Rana Dorada in Panama. Frog exhibit and fun activities for kids. PUBLIC FORUM. Presentations by Dr. Roberto Ibañez, Dr Justin Touchon and Lucrecia Arosemena. Come to Summit with your friends and help to save frogs! Parade participants please meet opposite the church. Participants should dress festively, inspired by frogs. Educational activities and exhibit of the amphibian conservation center and golden frogs. Celebrate Golden Frog Day (English) from Melissa Mak on Vimeo. 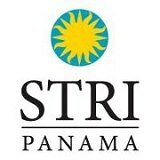 Organizers: Autoridad Nacional del Ambiente, Smithsonian Tropical Research Institute, Summit Municipal Park, El Valle Amphibian Conservation Center, Panama Amphibian Rescue and Conservation Project, La Rana Dorada Pub, APRADAP, FUNDECO, Cámara de Turismo de El Valle de Anton and Corregiduría de El Valle de Anton. This years’ celebration of ‘Save the Frog Day’ was held at Summit Municipal Park on April 27,2013 where the Amphibian Rescue and Conservation Project is currently housed. 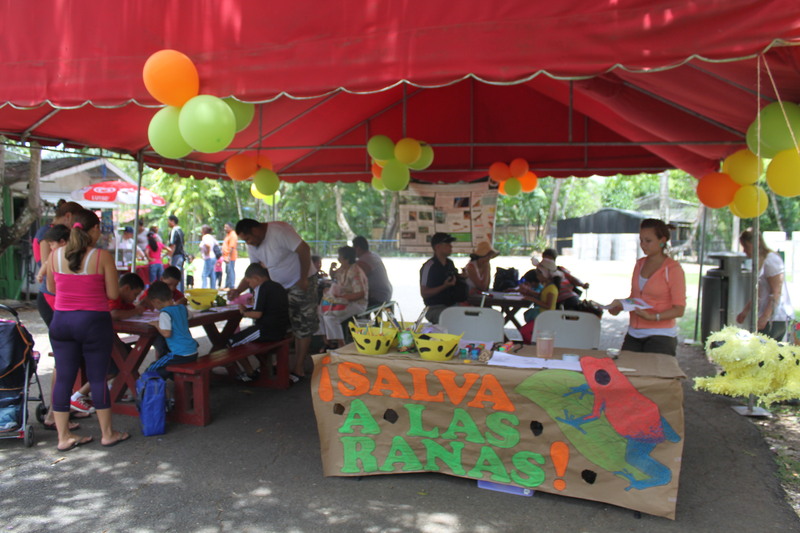 A booth was decorated with balloons, a golden frog piñata (for donations) and a large banner to draw the families and children who frequent the park on weekends. This Saturday was no exception. We estimated that approximately 85 children shared in the activities. We also received 165 signatures on our Save the Frog Day sign up poster. All throughout the day we had a steady stream of inquisitive children anxious to paint frog masks and were rewarded for their efforts with frog-shaped chocolates and stickers. There were those who would like to paint more if their parents hadn’t reminded then that there were lots of other things to see and do yet that day! For the more inquisitive and brave visitors there were containers filled with some of the frogs’ favorite snacks. There were extra- large cockroaches, crickets and meal worms and their parents the beetles. We would have to say some of our guests weren’t as excited about those. Some were a bit horrified from the looks on their faces, yet were understanding when we explained that these were very nutritious and necessary to keep them healthy. A large poster displayed the wide variety of shapes, colors and sizes of frogs live here in Panama. We are excited and looking forward to next year when we will be settled into our new facility in Gamboa, where everyone will be able to appreciate the beauty and wonder of the precious creatures we are celebrating and fighting to preserve. Until next year, everyone keep up the good work! On September 23, Jeff Corwin of Animal Planet fame and Defenders of Wildlife went to the National Zoo to launch the “Feeling the Heat with Jeff Corwin” series of 11 videos on the impacts of global warming on wildlife and release Jeff’s series of 4 children’s books. And on this sunny morning, Jeff met up on the banks of Rock Creek with 30 lucky third-graders from Chevy Chase Elementary school to learn a little about frogs. Together, the team assessed the habitat and the water quality in the stream, finding that it was pretty good. That’s good news for frogs, especially in such an urban environment. But as we learned that day, frogs all over the planet are in the fight of their lives. Jeff showed us the Amazonian horned frog, a very cool frog with a really big mouth, and then he introduced us to one of the most threatened frogs on Earth….one of the few Panamanian golden frogs left in the world. 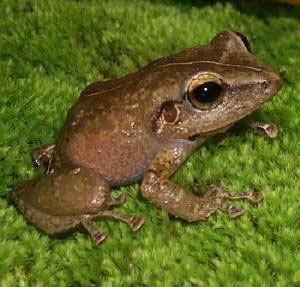 These little beauties are being impacted by chytrid fungus and have been extirpated from the wild. Jeff showed the kids his new Defenders of Wildlife video on frogs from the “Feeling the Heat” series, which highlights the impacts that chytrid fungus and a changing climate are having on frogs and other amphibians. It set the stage for a discussion about the impacts of chytrid fungus on Panamanian golden frogs, why the kids felt frogs were important and what the Panama Amphibian Rescue Project is doing to save them. By the end of the day, the students were charmed by the many frog ambassadors at the zoo and concerned about their plight. They all walked away with a signed book from the Jeff Corwin children’s book series and hopefully a memorable experience they will pass on to others about the fragility of life on earth and our responsibility to conserve, because these young minds are the environmental stewards of the future.